Last night I volunteered at an inspiring event through C.E.O. Women. This amazing non-profit empowers immigrant and low-income women to create economic opportunities for themselves through starting their own business. 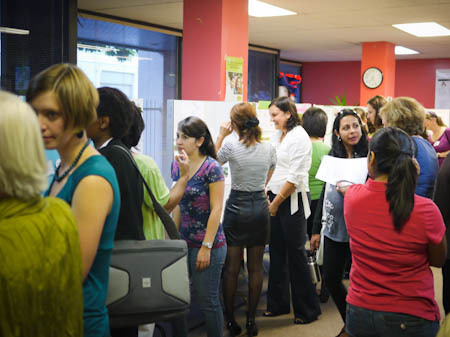 Through a rigorous 16-week program, the women learn English and entrepreneurial skills. The program culminates in their “Storefront Presentations” where they showcase their business idea and share their plans with us. I’ve been volunteering with C.E.O. Women off-and-on since 2005 as a business coach for a massage therapist from Japan and a jewelry designer from Peru and guest presenter but this was my first time attending the Storefront Presentations. It was so much fun to get to talk with the women about their ideas and see their visual presentations (very much like a Right-Brain Business Plan!). We were encouraged to ask them lots of questions like who their target customers are and how much will it take to start their business so they get practice talking about what they do. The women last night we’re totally engaging and oh-so passionate! I met a coach, a professional organizer, and women who wanted to open up a day care, consignment shop, lunch delivery service, a floral design business, and more. I came home feeling inspired by the passion and dedication of these fabulous women who are overcoming obstacles left and right so they can live their dream. If you’re in the Bay Area and want to get involved, they’re looking for their next round of volunteer business coaches starting next month.